•Actual amp shown, click on images to enlarge. Voted "Best Amplifier of year" at NAMM 2010! The latest in lightweight bass amplifiers from Genz Benz, these new models utilise the same Class D amplifier technology as our Shuttle 6.0 series. The ShuttleMAX series offers the most full featured preamp designs, and highest output power available in this class of compact, lightweight amplifiers. 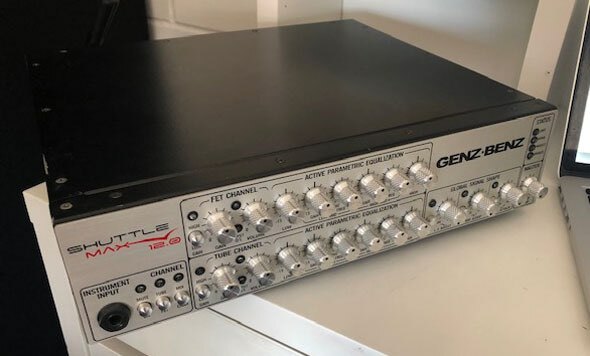 Preamp features include: FET and 12AX7 TUBE channels--selectable and blendable, low and high gain settings per channel, four band Active EQ networks with dual parametric mid-range networks, adjustable signal shape circuits and complete LED status indicators. The rear panel design is just as complete with our studio quality XLR D.I. interface, 3 effects loops, aux. input, headphone out, tuner out, footswitch jacks and Speakon® outputs. The dual preamps offer extreme versatility from deep transparent slap tone, to focused, organic mid clarity, to all-out rock grind. The 12AX7 tube channel provides a wide range of gain structure that produces smooth, clean tube warmth or can be dialled all the way up to the critical mass of aggressive overdrive. All tone variations are accessible from the 5 button footswitch which is included. The ultimate in power and design, this model delivers over 1200 watts of output from an amp that weights only 6.75 lbs. With dual Class D amp modules this ShuttleMAX produces its full output into two 4 ohm loads (one per amplifier output). The full output of the ShuttleMAX 12.0 is perfect for any venue and playing style. Designed with identical EQ networks for the FET and 12AX7 tube channel the tonal flexibility and power output of this bass amplifier is unsurpassed. Dimensions HxWxD - 3 1/2" x 13 1/2" x 13"